I have recently been voted in as my chapter president and little did I know what I was inheriting. I had a meeting with the Greek director at my school and I have learned that my chapter of 14 has 6 brothers that are below a 2.5 GPA going into this spring semester. I’m at a loss with a brotherhood that has already scheduled their spring classes on how to improve their grades without mandating certain things. So my question to the fraternity advisor universe is how can I motivate my guys to start paying attention to their grades over parties or just apathetic mentalities. First off, you need to get to know your brothers better. If you are only a chapter of 14, and you don’t know if some brothers are struggling academically, then you are not as close to your brothers as you need to be if you are president. I am a firm believer in that as long as the brother is in good academic standing with the university, then the chapter should stay out of it. No two curriculums or situations are the same, and how is the chapter more qualified to establish GPA requirements than the university? That doesn’t mean that striving for academic excellence is not a goal of the chapter though. It needs to be a focus and as president you need to establish a culture where academics are stressed. Also – check out the articles in this category on TFA – Fraternity Academics. I am a brother of a small, local fraternity on a small liberal-arts campus. We are staying afloat with ten brothers currently. Other fraternities are larger than we are. We have recruited hard lately but with little success. We don’t have much money to throw around, seeing as there are only ten members. How can we recruit more good men on a campus that is dominantly women? You have a distinct advantage over the larger chapters on your campus. You can sell the fact that the men you are recruiting now will be able to leave their legacy on your university by turning your small chapter into something special. This is a leadership opportunity that many guys would love to have. This is what appealed to me when I joined a colony as a freshman. 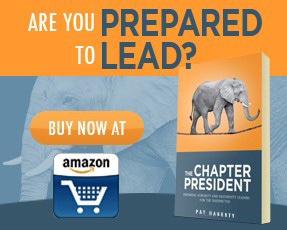 Also, be sure to check out Chapter 1 in my book The Fraternity Leader – How to Make Your Chapter the Best on Campus. In that chapter I lay out a detailed strategy on how to develop your recruitment plan and improve semester after semester. I have been recently elected Treasurer of my Fraternity. It is my duty to produce an idea for a fundraiser before Valentine’s Day 2014. My problem, I grow tired of the same old fundraisers that every organization does and want to find something new and exciting that will really rake in the dough. We are a local organization and have absolutely no national support, we also do not have a fraternity house but do have control of one floor in our dormitory. If you have any ideas that could possibly help our cause, please let me know. The key to a fundraiser is it has to have the maximum earnings potential with the minimum amount of effort from the brotherhood. Let’s face facts – while the brothers want to have more money, they really don’t have the desire or ambition to go work for it. I HIGHLY suggest doing a raffle every semester. It is easy, and you can raise a lot of money fast. Also, in my book The Fraternity Leader, I highlight 18 fundraising ideas where you can earn $40,000 pretty easy. I wanted some tips on how to become close to your “little brother” in the fraternity. I got paired with two fall pledges as my little brothers and I immediately became very close with one but not the other. We don’t seem to have much in common and never really know what to say whenever we have conversations with one another. What are some things I can do to improve our relationship? Don’t put yourself in situations where you have to perform (aka have a conversation) if you are worried about it being awkward. DO something instead. For example, don’t take your little brother to dinner. That forces you to talk to each other one on one and could lead to the problems you are having. Instead, take him to go play ball. Take him to a ball game or a concert or a party. Help him study. Plan an activity where that is the focus, not your conversation. You will have a good time and will bond through the experience. It will also give you something to talk about in the future. I am thinking about joining a fraternity in the spring, but I am also applying to schools that I might potentially transfer to for next fall where I would want to join a different fraternity. Would you recommend not joining a fraternity at my current school? Our chapter is unrecognized by our school, but we are a legit chapter with a charter and have been here since 1993. The administration does not like us at all on their campus. Since we are banned from doing any events on campus, it is impossible to fundraise correctly. We need creative fundraising ideas, PLEASE HELP US! Check out this article on fraternity fundraising. Should I Quit the Fraternity?